The T23 was a medium tank project meant to replace the M4 Sherman, but it never got off the ground. The turret, however, was used to upgrade the Sherman tank, and that is why it is referred to as the T23 turret. 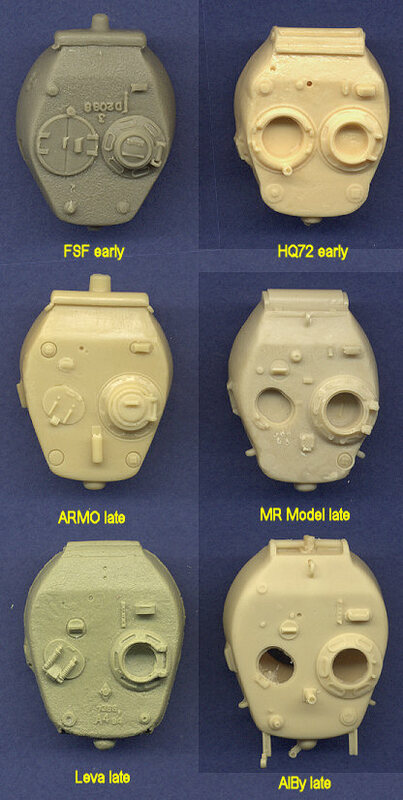 This page provides comparison scans between as many Sherman 76mm T23 turrets as I can find, including those available as separate conversion sets (labeled as "Turret Kit"), as well as turrets from various plastic and resin kits and conversions. 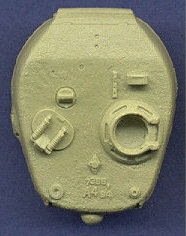 The Al.By T23 turret represents the later version with an oval loader's hatch. Both of the hatches are molded open, which is a nice touch, and unlike some of the other resin kits, the gun mantlet is molded separate, so that we can set the gun elevation to whatever we want. 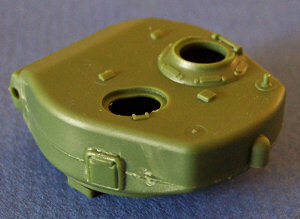 The .50cal storage racks are molded onto the turret rear, and look very delicate, and well made. 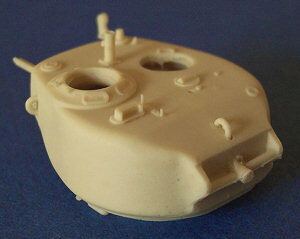 There is also a pintle mount for the MG on the turret roof. I must say that this comparative review has caused me to completely revise my earlier impression of the Al.By T23 turret. I used to think this turret was exceptionally well done, in line with Al.By's reputation, but in fact, this turret really is not that good. 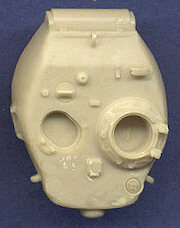 It is obviously based on the old Hasegawa plastic piece, but has been modified. 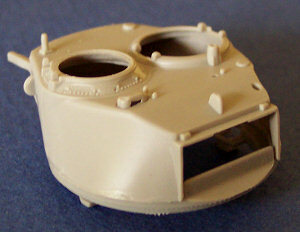 The forward portion of the turret roof, behind the gun mantlet, has been smoothed and the step removed from the armor plate, but the overall plan view of the turret has not been altered from the original plastic piece, meaning that it is still too large and rounded. The front corners in particular do not have enough slope to them, and are near vertical. The reason I was originally impressed with this piece was because most of the detail on the turret roof was altered and improved from Hasegawa's kit. The split loader's hatch was replaced with the later style oval hatch; the commander's cupola was replaced with a more detailed one; the commander's periscope cover was improved, etc. So although this turret has a very high quality of detail, the profile and plan shapes are incorrect, thus scoring it low on the overall list of recommended kits. Early version with split loader's hatch. Comes with metal gun barrel and etched brass details. See review below on ARMO's late T23 turret for additional notes. The ARMO T23 turret comes in two variations: the turret in this review is the late version with the oval loader's hatch; ARMO also markets an early version turret with the split loader's hatch. Both hatches are molded closed, which is unfortunate. This is a very good turret, one of the best available. The size and shape are very accurate, with only slight discrepancies, such as the turret bustle where it could stand to be a little narrower in plan view. As far as I can tell, this is a modified Revell turret, with a small amount of bulk added to the turret walls to slightly reduce the angle of the slope in the walls, and of course, the replacement of the split loader's hatch with the later oval hatch. This hatch, however, sits slightly above the turret roof (it is molded closed), when it should actually sit flush with the roof. 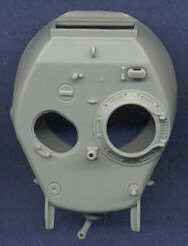 The .50cal pintle mount is molded onto the turret in the folded position, but it would be easy enough to carefully cut it off for display in the upright position. The .50cal storage brackets for the turret rear are provided in etched brass, and will likely look much better than those kits that include these parts in resin. 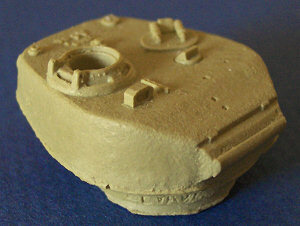 The turret walls are very smooth, and a slight cast texture would have been appreciated. Additionally, I don't like having the gun mantlet molded onto the turret face, as that limits the modeler to how the gun elevation can be displayed. Comes with metal gun barrel and etched brass details. Ca.Ma. 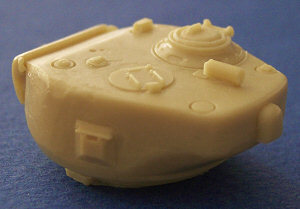 M4A3 (76)W, Turret Kit Resin ? CPL Overby's Motorpool M4A2 (76)W, M4A3 (76)W Resin ? Early version with split loader's hatch. Pretty much the best turret in this scale. 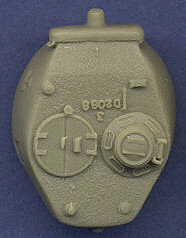 Open crew hatches; superb surface details; a nice cast texture to the armor; the commander's cupola is molded to the turret roof, but the hatch ring for the loader is a separate piece, allowing us to put it in whatever position we choose, though it comes keyed to a specific orientation (pictured in the scan). The pistol port hatch is a separate piece, though the opening on the turret side will need to be opened if you want an open port. The ventilator on the rear of the bustle is a also a separate part. Late version with oval loader's hatch. Pretty much the best turret in this scale. Open crew hatches; superb surface details; a nice cast texture to the armor; there's even a casting mark molded on the turret roof. The pistol port hatch is a separate piece, though the opening on the turret side will need to be opened if you want an open port. The ventilator on the rear of the bustle is a also a separate part. 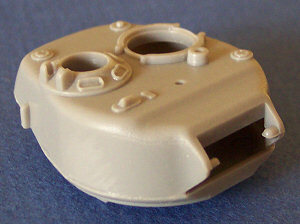 Unlike the previous turret, this one has mounting lugs behind the gun mount for the mount's canvas cover. The Eduard turret is a very nice piece. It represents the early style with split loader's hatch. 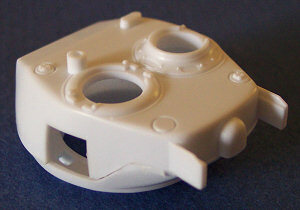 Both the loader's hatch ring and the commander's cupola are separate parts, which allows the modeler to turn the hatches to whatever orientation they choose, which was a feature unique to this kit among most of the available turrets, until the Dragon kits were released with the same feature. The size and shape of this piece are very good, though it may be just a little bit short. The lack of a rough texture on the turret armor is disappointing. Granted, in this scale the texture would be barely noticeable, but even a flat texture would have been preferable to the highly polished plastic that comes with the kit. Comes with photoetched details in the kit. Fine Scale Factory M4A1 (76)W w/Sandbags Resin ? Modified Revell turret(?) with sandbags. See review below for additional notes. 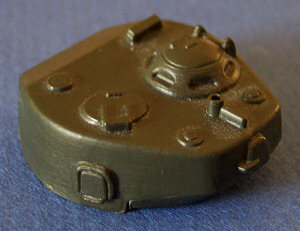 The Fine Scale Factory T23 turret represents the early version with the split loader's hatch. 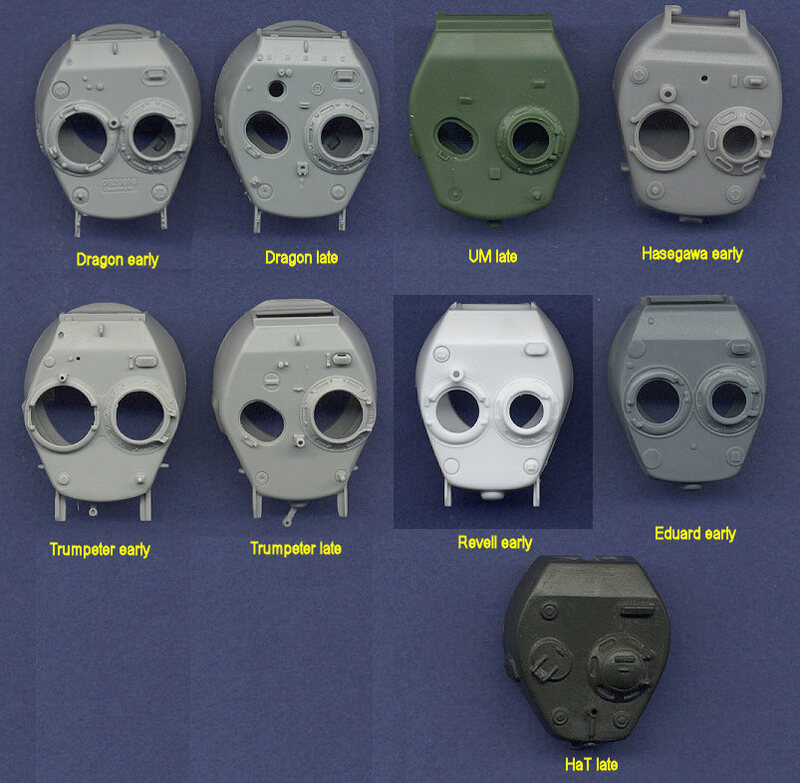 Its gun mantlet is molded onto the face of the turret, thereby eliminating any room for altering the gun elevation. Both hatches are molded closed. It appears that this turret may be a completely original piece. It shares the same rough dimensions as other resin turrets based on the Revell turret, but if it was originally converted from that kit, then it has been greatly modified. 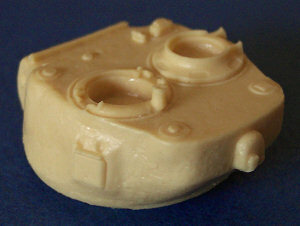 Unfortunately, it has a serious error in its shape: the side "cheeks" seem very swollen at the base, almost as though the turret was set on a hot plate and started to melt. 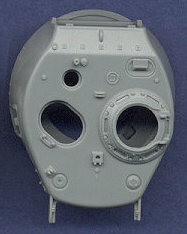 The pistol port even seems to be sunk into the turret side wall. I think these bulged cheeks can be fixed with judicious use of sandpaper or grinder, but then the nice cast texture of the turret walls will need to be replaced. 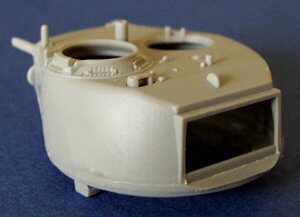 The center portion of the turret roof is slightly concave, I think as a result of the resin shrinking slightly. Goffy M4A1 (76) w/Sandbag Armor Resin ? I have not seen this kit in hand, but the turret appears to be modified from the Revell kit. 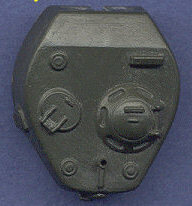 This turret represents the early version with the split loader's hatch, which was probably not very common for an HVSS Sherman. As has been pointed out in several places on this site, the Hasegawa Sherman kit is not a great model, with serious errors in shape and size. Concerning the turret, its primary flaw is its size and the shape of the front side walls directly behind the gun mantlet, which are near vertical when they should have a significant slope to them. The bustle is too wide and the commander's hatch opening is too small. 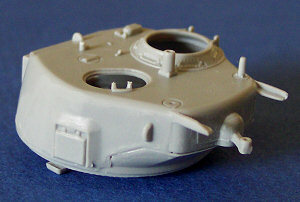 There is also a significant step on the turret roof behind the mantlet, when it should in fact be sloped. The HaT turret represents the late version with oval loader's hatch. 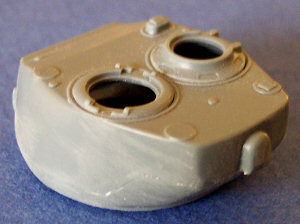 Unlike the earlier 75mm turret from this company, this T23 turret is not accurately shaped. 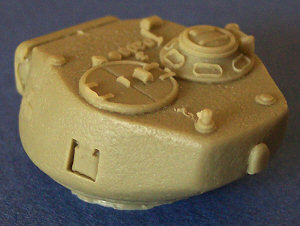 The side walls bulge out slightly too much, making the base of the turret appear too wide (the widest spot on the kit's turret roof is in front of the crew hatches, when in fact, the widest spot should be in line with the hatches). This can be taken care of with some judicious sanding. Actually, I think that the hatches themselves are located too far to the rear. 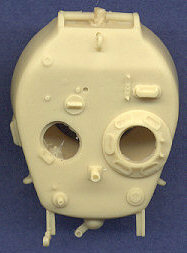 Note as well that both of the hatches are molded closed. Also difficult to fix will be the bustle, which is too narrow in plan view. 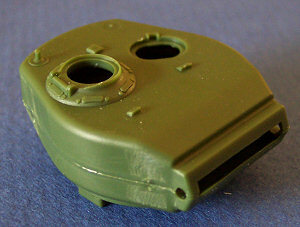 HaT recognizes that the loader's hatch should not stand above the turret roof plate when closed (it should be flush with the roof), and they say that when a new run of the kit is molded, this flaw will be fixed. Converted from the Eduard turret, this piece represents an early turret with the split loader's hatch. The size of the turret and its hatches are pretty much all that remains of the original Eduard turret. The shape has been modified, in particular on the turret walls, and a superb cast texture has also been added to the armor surface. 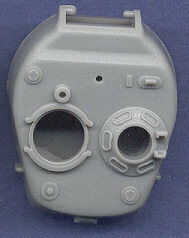 Both hatches are molded open, though some digging will be necessary if you want to add figures. Overall this is one of my favorite resin turrets. 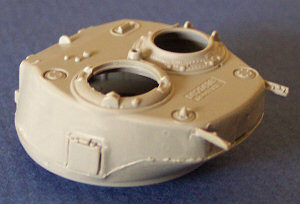 This turret is a late version with the oval loader's hatch. 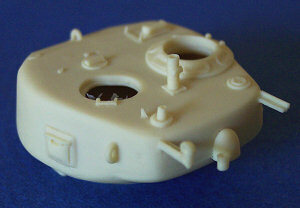 Though this piece has decent detail, it is one of the worst resin turrets made. 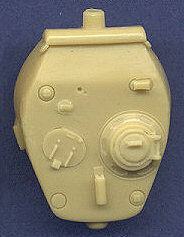 The commander's hatch is molded open, but the loader's hatch is closed. Like other kits with the oval hatch, it sits above the roof, when in fact it should be flush with the roof when closed. It appears as though this piece may have been based on the Hasegawa turret, but it has been heavily modified. The turret roof behind the gun mantlet has been improved as have the turret sides, though the cheeks need to be sloped just a little bit more. The bustle is quite a bit too wide, though it should be easy to narrow it down some with a grinder. 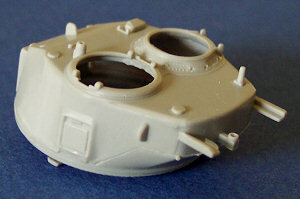 In profile view, the turret appears flattened, which will be very difficult to correct. 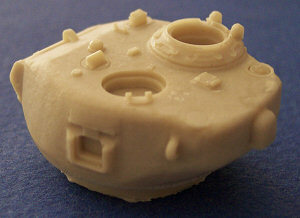 The center portion of the turret roof is also slightly concave, I think as a result of the resin shrinking slightly. There is a heavy cast texture to all surfaces which I think may be a bit overdone, in particular, on the roof. The casting numbers are a nice touch. 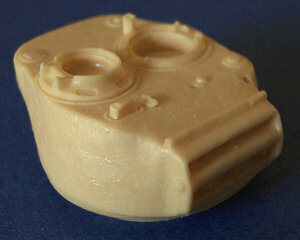 The .50cal storage brackets on the turret rear are cast in resin, and are a little bit heavy, though not too bad. Leva M4A1 (76) w/Sandbag Armor Resin ? I have not seen this turret, but if it is a modification of the turret above, it's probably not very good. Modell Trans M4A3 (76)W HVSS Resin ? I do not own this kit, but from photos I have seen, it appears to be a conversion of the Revell turret. Includes open hatches with figures. 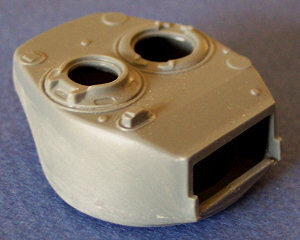 Cannon is without muzzle brake, which differentiates this turret piece from the one below. Modell Trans M4A3E8 HVSS Resin ? I do not own this kit, but from photos I have seen, it appears to be a conversion of the Revell turret. Includes open hatches with figures. Cannon has muzzle brake. Early T23 with split loader's hatch. See description below for more comments. 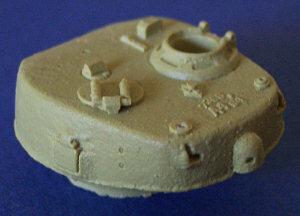 This example is the late version with the oval loader's hatch, and both crew hatches are open, though they will need to be deepened to add figures. 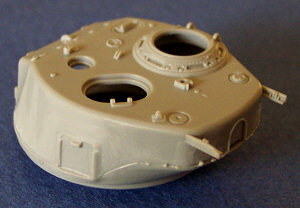 It is a modified Revell turret, and shares the same shape and size of that kit, though it has a very delicate, and I think very accurate, cast texture added to the walls and roof. 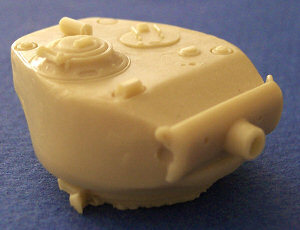 The size and shape are all that remains of the original Revell turret, as all the surface details have been replaced with more accurate and detailed representations. All things considered, there really is nothing to complain about with this piece. It appears to me to be just about as perfect as one can get. Conducting the comparison for this article has caused me to re-evaluate my opinion somewhat of the Revell turret. I used to think that this turret suffered from several flaws, but I now have a much better appreciation for it (but not for the rest of that kit!). While I still think that the slope of the side walls directly behind the mantlet is just a little too steep, the overall size of the turret is actually very good. This turret represents the early variant with the split loader's hatch, and that variant had steeper walls behind the mantlet than the later version with the oval loader's hatch. The highly sloped walls that this kit exhibits are more appropriate for the late turret version with the oval loader's hatch. 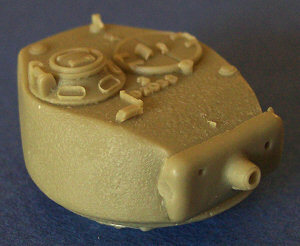 In order for the modeler to improve this piece, I think a bit of bulk should be added to the turret walls to reduce the slope a slight amount, and the polished plastic surface should also be "roughed-up" a little bit with some very fine grit sandpaper. TP Models M4A1 (76) w/Sandbag Armor Resin ? Early version with split loader's hatch. Very good size and shape of the turret, but crew hatch openings are far too large. The detail is abundant and crisply molded, surpassed only by Dragon. 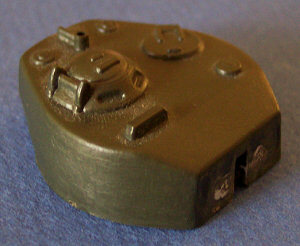 There is no texture added to the turret surface, only highly polished plastic. 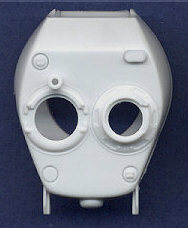 The pistol port is molded closed and is therefore a little bit flat. If one can find replacement turret rings and cupolas to replace the ones molded on to this turret, it could be built into an excellent piece. The way it is now, with the turret hatches closed, it's likely that most people will not notice the hatch size error. Late version with oval loader's hatch. Very good size and shape for the turret, but cupola opening is far too large, and the loader's hatch is a little bit large as well. The detail is abundant and crisply molded, surpassed only by Dragon. 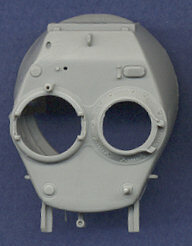 There is no texture added to the turret surface, only highly polished plastic. 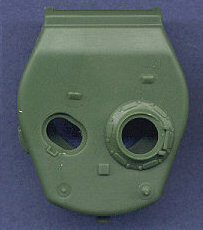 The pistol port is molded closed and is therefore a little bit flat. If one can find a replacement cupola to replace the one molded on to this turret, it could be built into an excellent piece. The way it is now, with the turret hatches closed, it's likely that most people will not notice the hatch size error. Incorrect size and shape. Sparse detail, and what is present is extremely poor. I don't have much to say about this one because of how incredibly disappointed I am with it. I had such high expectations for this company, and they blew it.